This April’s Sat Nam Fest offers us a special opportunity to gather together to co-create cosmic love. Join in this experience — a debut performance of GuruGanesha Band’s new song Game of Love. We can trust that a live performance with the GuruGanesha Band is so special because the audience is also in the band. 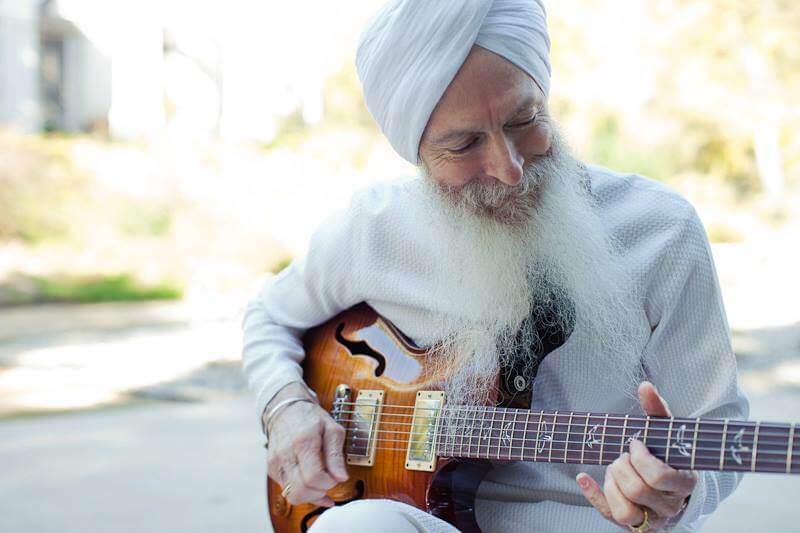 GuruGanesha Singh is a singer, songwriter, and guitarist of GuruGanesha Band [Editor’s Note: He is also the founder of Spirit Voyage Records and considered the father of the Kundalini Music recording movement]. He took some time to talk to us on the Spring Equinox! GuruGanesha Singh is a master of Chardi Kala. Chardi Kala is a term used to describe a state of being in eternal optimism and joy. GuruGanesha Singh embodies this state of being. Here, he shares a little bit about his creative process with a new song, Game of Love. Sat Nam Fest Blog: Can you talk about your creative process with music? I start every day with Sadhana. I wake in the morning and enjoy a nice, cold bath. Then I practice 20 to 30 minutes of yoga for maintenance. I need to do this set just to get everything working from the spiritual body to the 30 trillion cells, get the spine working from the base to the top of the head. Then I do “One-minute Breath” pranayama for 5 to 11 minutes. Then I chant to Guru Ram Das. This is my go-to for everything. On days when I have a heavy heart, like the day when I found out about the massacre in New Zealand, I sit down, and I start singing to Guru Ram Das. And it seems to heal the heart. It creates a space deep within myself where I feel my prayer can really make a difference. Then I pick up my guitar and trust what comes through. These words are in the front page of a book of the Siri Singh Sahib’s poetry. I have been rereading that for a long time, but recently a few months back, the music just came through. While I was looking at the words, this Grateful Dead-ish chord progression just came through and then I started singing it, and the words fit EXACTLY. It didn’t require any massaging. Sometimes writing a song you have to massage the melody and words to get things to fit right, but this just fit perfectly without much massaging. And at Winter Solstice, I sang it with Snatam Kaur, and she said she couldn’t get it out of her head. At Sat Nam Fest West, we will be doing the full blown rock ‘n roll version of this song for one of the first times live performance. The song is called Game of Love, and it will probably be the title track for the next album. We’ve had People of Love then Love is Love and now Game of Love. 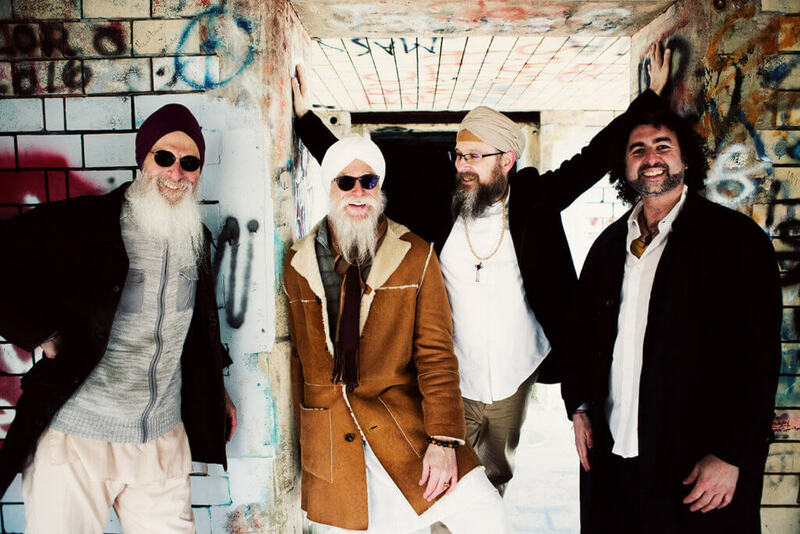 A little history: one of the first albums we were ever involved with at Spirit Voyage was an album called Game of Chants that featured Guru Singh, Snatam Kaur, Seal, Jai Jagdeesh, and a variety of voices a similar kind of energy, very uplifting mix of English, mantra, vocal ad libs, lots of guitar ad libs; it’s a fun band with nectarian, etheric music. Game of Love has that energy along with a more of a let’s have a spiritual party sound. Join GuruGanesha Band for a concert Thursday, April 10 at 7:30 PM in the Sat Nam Pavilion to experience Game of Love as a live performance. Let’s co-create the bliss!